Are education and student satisfaction antithetical, as is argued in this article written by Prof. Joanna Williams in Times Higher Education (16 October 2014)? The premise is that resources are expended on facilities and services to ensure student satisfaction erodes the authority and importance of academic work and subject matter knowledge. Of course, there is some truth in the article. However, as readers of this blog know well, the quality of teaching and value of higher education can be greatly improved, while the prevalence of teaching errors means that only a small percent of professors are truly good at what they do. In my experience, students do think of themselves as customers and expect better administrative and academic services for the tuition and fees that they pay. Though, I have not yet come across students in public higher education who have expressed a concern of the appearance that their degree has been bought. I understand the frustration expressed in the article, which has more to do with the diversion of resources from academics for facilities and services. In my own university, academic advising performed by full-time staff advisors is seen as critical for helping students chose their major area of study, financial aid, course scheduling, progression through their program of study, and graduation. Perhaps so. 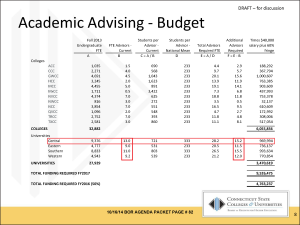 With the exception of choosing a major and financial aid, the staff function is duplicates the academic advising that professors conduct twice a year with undergraduate students in their department. 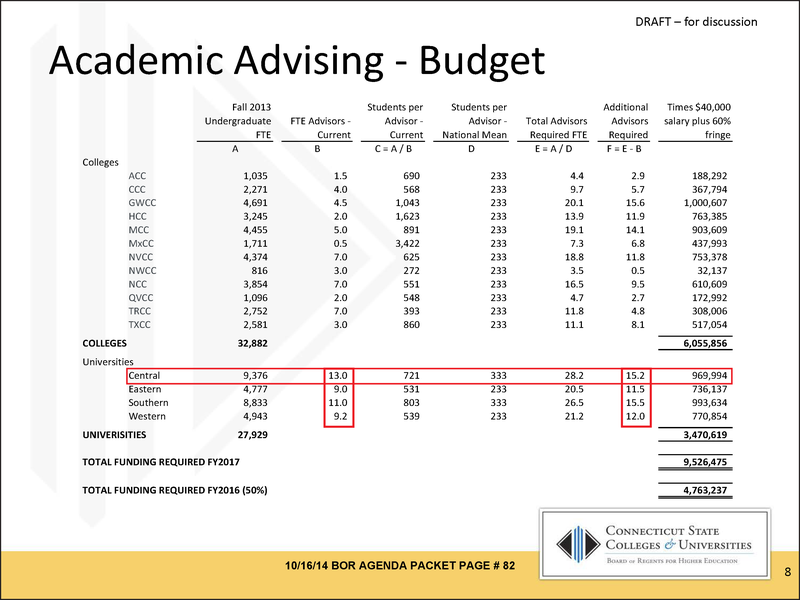 So, while department chairs and faculty are unsuccessful in obtaining new faculty lines for programs that are growing or that have many students, and which are aligned with the priorities and interests of the State and of employers, the administration budgets over $9,000,000 to more than double the number of full-time advising staff as shown in the image to the right (click here for source p.84; red boxes are mine). This request to hire an additional 54 people, 15 of which would be located at my campus (at a cost of $969,994), has a far better chance at being funded than just one additional revenue-generating faculty line in my department to support our undergraduate manufacturing management and graduate technology management programs. This is the kind of management decision that drive faculty nuts. Of course, there is no effort to understand and improve the advising processes performed by staff and faculty, as Lean thinkers would do. That will surely lead to a doubling in student advising capacity for both staff and faculty, while greatly improving quality and significantly reducing the time to takes to advise students. That would save $9,000,000, thereby reducing the cost of higher education. Or, much of the $9,000,000 could be used to fund revenue-generating faculty lines for programs that are growing or that have many students, and which are aligned with the priorities and interests of the State and of employers. Education and student satisfaction are antithetical to faculty who don’t know Lean. For those that do, education and student satisfaction must go together for the good of all. To argue otherwise will cause delays in improvement and worsen higher education’s many problems.